This fascinating book takes you on a magical journey around the world seven times with The Great Raymond, a Master Magician of remarkable charm and skills. Learn about the hardships, trials, and glory of theatrical magic from the 1900s to the 1940s. Thrill to ...includes full-color reproductions of 19 exquisite Raymond postersstories about Raymond's travels, his magic and his lectures on such exotic topics as his Shrunken Heads from Ecuador. This 343-page book with three appendixes includes full-color reproductions of 19 exquisite Raymond posters, a number of which are believed to be one of a kind, and 24 pages of rare full color photographs of Raymond's equipment and costumes. In addition, the reader will find more than 100 black-and-white illustrations depicting Raymond's fabulous stage settings, illusions, personnel, advertising, and scenes from a lifetime of magic. The authors personal friendship with Litzka Raymond Gibson lends a special insight to this remarkable story which is a contribution to theatre history. Each cloth-bound book features two of Raymond's beautiful posters on the four-color dust jacket. The book spine is lettered in gold, and the cover is gold-embossed with Raymond's monogram. "The treasure at the end of my rainbow this month is a pot of gold in the form of a handsome volume titled, The Great Raymond. My mind and eyes are dazzled by the wealth of pictures, insights, and story bursting within its covers. The book now stands on my shelf of conjuring's most elegant and informative literature." "The Great Raymond is an important addition to magical biography, imbuing the legend of a great showman with much fascinating factual detail presented via interesting text and beautiful graphics, within the covers of a handsome volume that must surely appeal alike to bibliophiles and collectors." "Theatrical history has been well served and magical history has been enhanced. At last, for The Great Raymond, justice has been done." "A word of warning--once you start reading this fascinating work, you won't be able to put it down. You'll become so immersed in Raymond's life that you'll feel as if you're actually living it...as you suffer through his difficulties and revel in his glorious successes." "Rauscher has brought people together, shown their human condition in life and death and celebrated their history. Highly recommended for the historian, magic buff and anyone seriously considering life as a large scale touring illusionist." "My comments about this book can not be put into a few words...it would take pages of praise." "One of this book's greatest attributes is the wealth of high quality photographs of Raymond, taken throughout his life." "This is a great read, a wonderful historical achievement, and a book that any lover of magic history and grand illusion will treasure. My highest recommendation..."
"It amazes me how books can be written about people who are dead. In this case Rauscher, has literally brought Raymond back to life! Now, we finally know Raymond, appreciate him and share in his exciting achievements." "...a lavish production...I found the book fascinating reading, and serious students of magical history will want it in their libraries." "The Great Raymond is perhaps the best biography of the decade...a wonderful way to put yourself into those adventuresome years of the early part of the century, when magicians were not only magical performers, but also world travelers and explorers. This is a must for every historian and collector, and the rest of you will enjoy it tremendously as well." "I am not a magician but The Great Raymond book held my interest and gave me insights into another time when dreams of travel seemed more difficult than going to the Moon!" "Rauscher has made it easier for me to identify with those who have traveled the world before me. 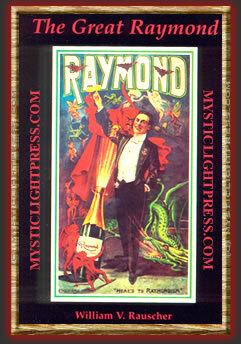 The Great Raymond is in the grand tradition of magic and adventure. I enthusiastically commend this book to both magicians and layman who seek a magical world beyond the horizon." "As an educator and layman to the art of magic this is a book I can recommend to any young person. Their reading journey with The Great Raymond is a marvelous introduction to the way things were, providing encounter with an exciting life and provoking many compelling contrasts to the way things are. Highly recommended." Paul B. Withstandley, III -Instructor of Spanish, The Brunswick School, Greenwich, Conn.
"The spirit of the Great Raymond was with me as I read. By books end I had learned that there's more to a magician than posters and packing crates." "You have produced a wonderful book that tells the real story of why the Great Raymond was great! It is one of the most magnificently produced books of magic history that I have ever seen." "In The Great Raymond, William Rauscher has uncovered and shared the fascinating story of one of the greatest magical entertainers and showmen of the early 1900's. This is a magnificently written and produced volume, complete in fine detail and bold color reproductions. I enthusiastically recommend it."